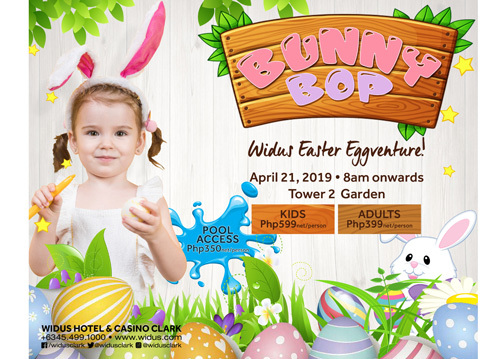 Gather your loved ones and make this year’s Easter weekend more memorable as Widus Hotel and Casino offers a festive family activity with its “Bunny Bop Easter Egg-venture." Be in your cutest costume and hop on over to Widus Tower Two Garden on April 21 where egg-citing treats and wonderful surprises await all kids and kids-at-heart. Power up and get ready to experience a day filled with fun games, delightful goodies, and interactive activities like an amusing parade of costumes and a thrilling egg hunt. Play and egg-splore with the whole family for only Php599/net per kid and Php399/net per accompanying an adult. Kiddie event ticket is inclusive of a loot bag, morning snacks, access to the egg hunt activity, and photo booth. Add 350/net per person to unwind and enjoy a refreshing day at the pool with the whole family. Further the occasion and make the family weekend egg-stra special when you book a pleasurable staycation at Widus Hotel. With rates starting at P5,800 per night, enjoy overnight accommodation in one of the hotel’s relaxing rooms, buffet breakfast at Salt Resto for two, two tickets to Bunny Bop Easter event, access to the hotel’s facilities, and use of standard amenities. Widus Hotel and Casino is located at 5400 Manuel A. Roxas Highway, Clark Freeport Zone, Pampanga, Philippines. For inquiries and reservations, call (+63 45) 499-1000 in Clark or (+632) 840-1430 in Manila, or visit www.widus.com.